Werk-Brau's excavator grading rake is specifically designed for land clearing and gathering of demolition debris. An additional for this rake also includes sorting of material. This attachment replaces the bucket. This grading rake is not designed to dig or rip soil. 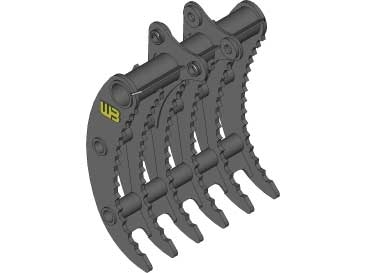 This grading rake can also be integrated with a thumb for duel hydraulic grapple action. Werk-Brau's grading rake is built using 2 skins for added strength. Wear resistant high strength steel is used extensively throughout the weldment and rakes construction. 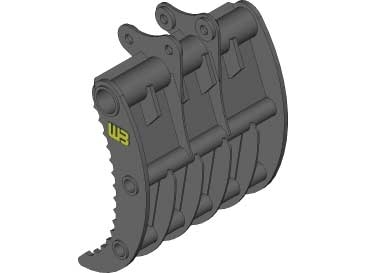 Each tooth is heavy duty and supported by reinforcing plates. Gussets are placed between tines for added strength. The grading rake can come in a variety of special widths. Additional tines are available. 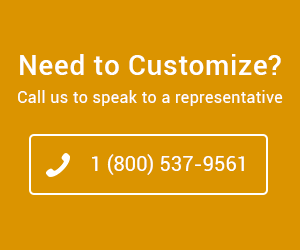 Special designs and options are available, please request a quote from a Dealer or contact Werk-Brau directly.